Combine the tropical fruit, red pepper, cilantro, sesame seeds, sesame oil and lime juice in a bowl and mix ingredients. Set aside. Remove the claws and crack open to remove the meat. Chop the lobster meat, then cover and refrigerate. Remove the stomach parts of the lobster body and rinse the body shell under cold water to clean. Refrigerate the body shells and discard the claw shells. Add the onion and cook, stirring frequently until well browned and tender about 8 to 10 minutes. Add the garlic and ginger; continue to cook for 1 minute. Add the curry paste, coconut milk, salt and honey. Bring to a boil, reduce heat and simmer for 5 minutes. Add the chopped lobster meat, bring to a boil and then remove from the heat. 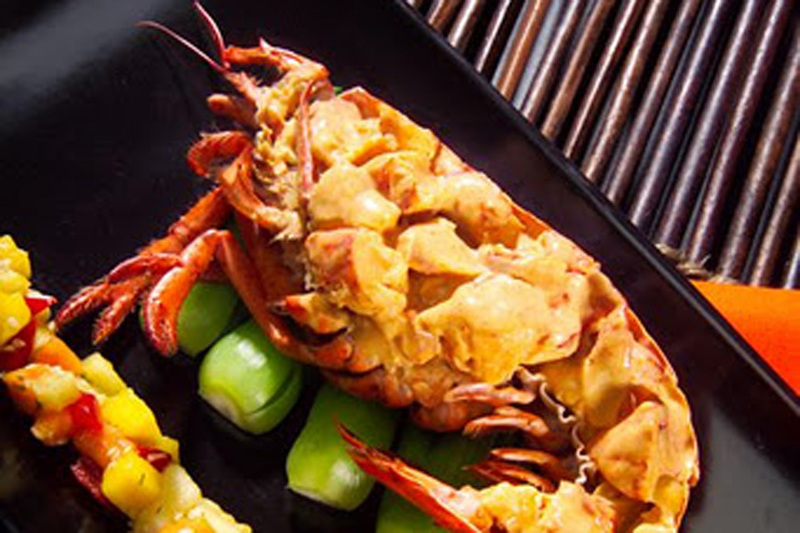 To Serve: Spoon the lobster mixture into each of the four half-body shells and spoon the fruit mixture to the side of the lobster.